There are many steps to creating the perfect destination-marketing campaign. You have to figure out who the people are within your audience, what they’re interested in, and what they’re searching for to land on your page. You then have to use all of the information that you’ve gathered about your consumers to craft compelling content that not only interests and entertains them, but also raises awareness of your brand and sells your product or service. After all, this is the main purpose of your writing. The key to writing content that sells your destination is to use persuasive language that directs your reader towards a certain action. Whether you’re speaking on behalf of your organisation or you’re just talking with a friend, the way that we communicate with others will always have some sort of impact on them – it’s human nature. We take in what we’re being told and then we react to it. These reactions can be small or large; regardless of size, they will act as indications of how your audience feels about your brand (when used in a marketing context). “Get in touch with us today”: this tells your reader what to do, and encourages them to take a positive action, which has potential to take further positive actions in the future. “Don’t hesitate to get in touch”: this tells your reader what not to do rather than what they should be doing, which doesn’t encourage them to act, and is less likely to result in further enquiry about your destination. Whether you’re communicating with an awareness-stage user on an informational level, or you’re urging a decision-stage consumer to make a purchase, it’s good practice to use positive language, because even a small positive reaction from the user is a step in the right direction for your brand (and you might even inspire them to make a purchase in the future). When you’re writing to sell, every element of your copy should be used to urge the reader to act. Remember that just because they’ve landed on your page, it doesn’t automatically mean that they want to visit your destination, so you have to nudge them towards making that all-important trip. In fact, using positive language with users who aren’t necessarily looking to buy anything is a great way to nurture them and to keep them interested in your brand. Encourage them to be proactive when it comes to your brand. If you provoke a series of small-yet-positive reactions from your target audience, such as downloading a brochure or signing up for a newsletter, it’ll increase the likelihood of them taking a larger action – such as booking a ticket to visit your destination. Avoid overly salesy language from the start, because you run the risk of scaring them away (and sounding like a one of those midday TV ads that shout deals at the unsuspecting viewer – nobody wants that). This is where positive language comes in handy, because you can encourage your reader to take small steps towards making a purchase (such as reading more of your content, or looking at your destination in more detail) without being in their faces. As we’ve outlined in a previous post, marketing a destination is different to marketing a tangible product. This is because consumers travel to destinations to experience whatever it is that those destinations offer. These experiences are usually tied to particular emotional responses, which become powerful tools when marketing destinations. The tactic of using emotions to sell a product or experience has been used since the early days of marketing, but when you find a key emotion that your consumer associates with, you can begin to incorporate it into every element of your content strategy. By using emotion-driven positive language, you’re more likely to get a strong response from your user and nudge them towards that all-important sale. 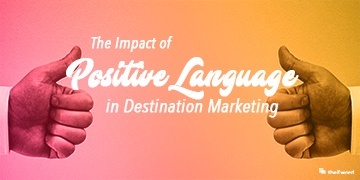 Now you know how to use destination-focused emotions to incorporate positive language into your content strategy, download our destination marketing guide to find out how to use them to piece together the rest of your digital strategy.